This blog is meant to keep others up-to-date about my views, experiences and readings in the areas of EU and global energy, environment, climate change and sustainable development policies. Willy De Backer is a former European (Belgian) journalist, sustainability opinion-leader and professional conference moderator with more than 25 years experiences in European Union politics. For nearly ten years, he worked in the European Parliament as assistant to a Member of the EP and a staff member of the Green Group. After having set up his own internet service company in 1996, he co-founded Internet news portal EurActiv.com in 1999 and served for 8 years as chief editor expanding the service from a start-up to a successful online media company. From 1 June 2007, Willy went freelance focussing his research and writing on issues related to climate change, energy security, green economy and sustainability in general. He was one of the first professional journalists who started using social media (Blogs, Twitter, Facebook, and other) to share his opinions on how to rethink our economic, social and political values and institutions in an age of “peak everything”. He also worked for two years as European Director of Mathis Wackernagel’s Global Footprint Network and was Head of Friends of Europe’s Greening Europe Forum, an online and events-based debate platform for the transition to a post-carbon society. Since February 2012, Willy has become Head of Communication and Publications of the European Trade Union Institute (ETUI). 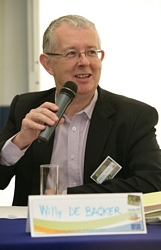 Speaking four languages (Dutch, English, French and German), Willy is a frequent moderator of high-level conferences in Brussels and in other European capitals (European Business Summit, Green Week, Sustainable Energy Week, Friends of Europe, ECOSOC, European Commission and Parliament and several corporate clients). He is also regularly asked to help with conference content preparation and sometimes also as policy advisor for particular campaigns or events. Hobbies: literature (especially the classics Charles Dickens, Thomas Mann, E.T.A. Hoffmann, James Joyce, but also H.P. Lovecraft and George R.R. Martin ), movies (favourite directors: Krzysztof Kieslowski, Kurosawa and Tim Burton), music (from classical to pop, experimental and gothic). I noticed your were recently writing about climate change on a few of your pages and I thought you may want to have a look at the CCC website. – have a look – http://www.theccc.org.uk/reports/. hi, nice to meet you.. I am really loving the theme/design of your web site. Do you ever run into any internet browser compatibility problems? A handful of my blog readers have complained about my site not working correctly in Explorer but looks great in Chrome. Do you have any ideas to help fix this problem? Hmm it appears like your site ate my first comment (it was extremely long) so I guess I’ll just sum it up what I wrote and say, I’m thoroughly enjoying your blog. I as well am an aspiring blog writer but I’m still new to everything. Do you have any points for beginner blog writers? I’d really appreciate it. I very delighted to find this web site on bing, just what I was looking for : D likewise bookmarked .